Photosynthetically Active Radiation or PAR refers to radiation with wavelengths between 400 and 700 nm. The term PAR has been applied to both energy and photon fluxes. The most common use today refers to total photon flux between 400 and 700 nm. The data set indicated with the solid black line in Fig. 1 shows the ideal relative response of a PAR sensor in terms of sensitivity to photons: the sensor has no sensitivity below 400 nm and above 700 nm, and a constant sensitivity from 400–700 nm. The spectral response of PAR sensors offered by Biospherical Instruments mimics this function (orange symbols in Fig. 1). When the responsivity of the same sensor is plotted with respect to its sensitivity to the energy content of these photons (dashed line in Fig. 1), the function has an increasing trend with a value of 400/700 = 0.571 at 400 nm, and 1 at 700 nm. The reason for the lower responsivity at 400 nm can be easily explained: photons at 400 nm are more energetic than photons at 700 nm because the energy of a photon QP is inversely proportional to its wavelength λ: QP = (hc)/λ, where h is the Planck constant and c is the speed of light. To get the same number of photons at 400 nm than at 700 (i.e., to get the desired constant quantum response), the source radiation has to be more energetic at the shorter wavelength. For example, the spectral irradiance of a source needs to be larger by a factor of 700/400= 1.75 at 400 nm than for 700 nm. As a consequence, a PAR sensor has to be less sensitive in terms of energy at the shorter wavelengths such that the product of spectral irradiance and sensor responsivity is constant. This is achieved with the function shown by the dashed line. A PAR sensor with a flat receiver measures “Photosynthetic Photon Flux Density” or PPFD. PPFD is defined as the number of photons in the 400–700 nm wavelength interval arriving per unit time on a unit area of a flat receiver. Less common terms for PPFD are "photosynthetic photon irradiance” and “photosynthetic quantum irradiance”. 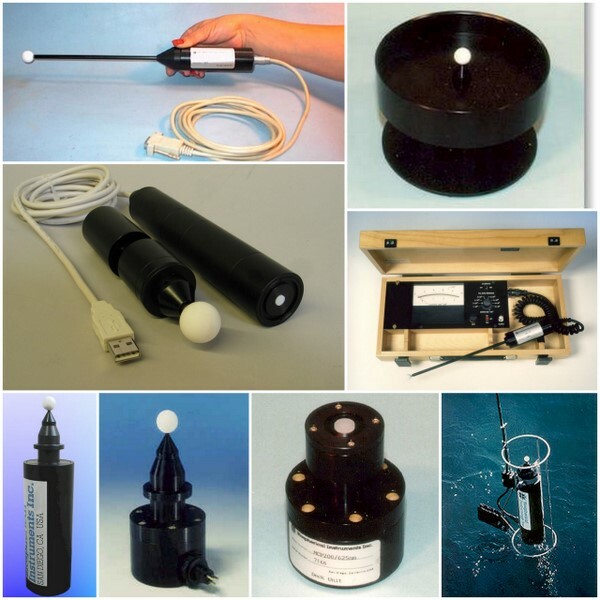 Examples of PAR sensors offered by Biospherical Instruments that measure PPFD are the AMOUR and sensors of the QCP and QCR series. A PAR sensor with a spherical receiver that is equally sensitive to photons from all direction measures Quantum Scalar Irradiance (QSI). An alternative term for this quantity is "Photosynthetic Photon Flux Fluence Rate" (PPFFR). QSI or PPFFR are defined as the integral photon flux of photons in the 400–700 nm wavelength interval at a point in space from all directions around the point. Examples of PAR sensors measuring QSI are Biopsherical Instruments' QSP, QSR, and QSL radiometers. quanta.m-2.s-1, quanta.cm-2.s-1, µE.m-2.s-1 and µE.cm-2.s-1. (µE stand for microEinstein. One Einstein is one mole of quanta). PAR may also be calculated by integrating the weighted visible channels from a multi-wavelength instrument such as a PRR or C-OPS. Biospherical Instruments introduced PAR sensors in 1979, starting with the QSL-100 for measuring PAR in the laboratory (Figure 2). This was superseded by the QSL-2100, which connects to a PC using an RS232 serial port. The latest sensor is the AMOUR, which plugs directly into a USB port and can have either a cosine response or a scalar response. Figure 1: Spectral response of a PAR sensor. An ideal sensor would be equally responsive to photons within the wavelength range 400-700 nm, and would have no response outside this range (black solid line). The orange curve shows the typical response of a PAR sensor from BSI, indicating good agreement with the ideal response. As photons at shorter wavelengths are more energetic than photons at longer wavelength, an ideal PAR sensor has to be less sensitive to radiative energy at shorter wavelengths. The ideal response expressed in 'signal per energy' is indicated by a broken black line. Figure 2: Different PAR sensors offered by Biospherical Instruments over the years.